The leaders of Australia’s booming metal revolution have matured and evolved since emerging as decent exponents of the Unearth brand of fiddly riffs and breakdown-heavy metalcore. Deep Blue in 2010 was a nigh-on perfect distillation of the genre’s most thrilling elements, with monolithic riffs and anthems that left an indelible mark, and their last outing, Atlas, saw Parkway Drive disprove the naysayers who claim they’re little more than metalcore by numbers, adding new dynamics, textures and all manner of bells and whistles while still giving the wheel a boisterous spin. However, the sheer scale of change on Ire initially suggests the Byron Bay five-piece have bitten off more than they can chew. First single Vice Grip raised worries with its glam rock guitars and cheesy choruses punctuated by Winston McCall’s impassioned chants of ‘Rise!’, while the style is tried again on Vicious, which sounds more imperative but still lacks the necessary punch. Alarm bells may well ring, but these are rare weak moments on an album where the band’s energy and sheer belligerence shine through whatever direction they take. Destroyer builds to a simple but infectious twin melody before erupting into a classic metal lead and precision riffs. Dying To Believe explodes out of the blocks with the most savage riff the band have ever unleashed before mutating as percussive blows rain down in a flurry of combinations. Crushed starts off with ominous Gregorian chants before its bass-heavy rumble and eerie mood that evoke both the groove and dark undertones of Korn, delivering a haunting wall of sound that elevates the ominous ‘Crushed by the fists of God’ to sound utterly colossal. Winston’s hopeful, albeit damning, reflections on the world have always helped the band stand out, and indeed the frontman sounds more enraged than ever on Ire, with repeated spoken-word delivery and impassioned, almost helpless pleas giving his voice menacing disdain. Fractures brings things back into more familiar territory with Maiden-esque guitars and a familiar ‘Whoa’ gang vocal that stands out via virtue of its sheer euphoria. The gorgeous strings that announce Writings On The Wall descend into a piano-led militaristic march and Winston’s harsh poetry that could easily be one of King 810’s chilling tales, while the shrill harmonies of Bottom Feeder see them continue the darker path before exploding into a huge, bouncing breakdown. The rhythmical, thrashing attack of The Sound Of Violence and the tweaks to Dedicated’s armour-plated barrage don’t need to stray too far from the path, while the gorgeous Spanish guitars, Celtic melodies and debut of clean vocals make A Deathless Song a successful, restrained first foray into the world of ballads. 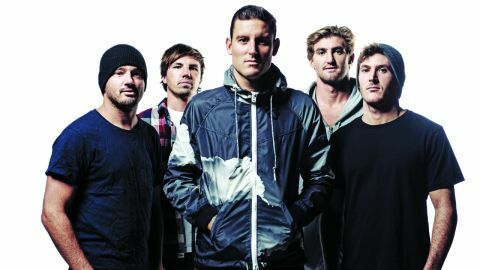 Despite the odd sidestep and inconsistency that stops it just shy of being a classic, Ire is an album that should be applauded for not only being a gallant effort that has seen Parkway Drive transcend the limits of metalcore, but also for producing moments of spectacle, which at their best result in the best songs of the band’s career. WHERE DID THIS ALBUM’S WRITING COME FROM? HOW DID YOU FEEL WHEN YOU HEARD WRITING ON THE WALL?